A consultative meeting to discuss the ‘State- Specific Rules’ in regards to implementation of HIV/AIDS (Prevention and Control) Act, 2017 as passed by the Parliament of India was on Tuesday conducted at a city hotel in Naharlagun (Arunachal Pradesh). 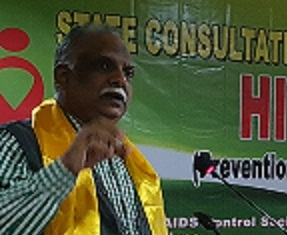 Attending the programme as Resource Person, National AIDS Control Organisation (NACO) Deputy Director General Dr Naresh Goel informed that the HIV and AIDS Bill 2014 passed by the Rajya Sabha and Lok Sabha and assented by the President of India was notified on e-gazette on April 21, 2017 and came into force on September 10, 2018. Highlighting the objective of the Act, Dr Goel said that it aims at addressing the stigma and discrimination to the disease thereby creating an enabling environment for enhancing access to services while safeguarding rights of persons living with HIV and those affected by it. It also aims at providing free diagnostic facilities and ART also called antiretroviral therapy to persons living with HIV and also to promote safe workplace, occupational exposure and strengthen system of grievances redressal. NACO consultant Garima Sharma, while explaining the gist of the Act, said that the Act need to be enacted after going through formal procedure in every State within a given time frame of 180 days. State’s Health Services Director, Dr M Lego, while chairing the session, said that the HIV/AIDS Act 2017 is an important one which will help in removing the stigmatisation of persons living with HIV. “Certain provisions may be added as per State-specific requirement with regards to Ombudsman,” he said. Arunachal Pradesh State AIDS Control Society Project Director, Dr Riken Rina, in his speech said that the Act requires cooperation and inputs from all stakeholders in order to finalise the State-specific rules for the Act.